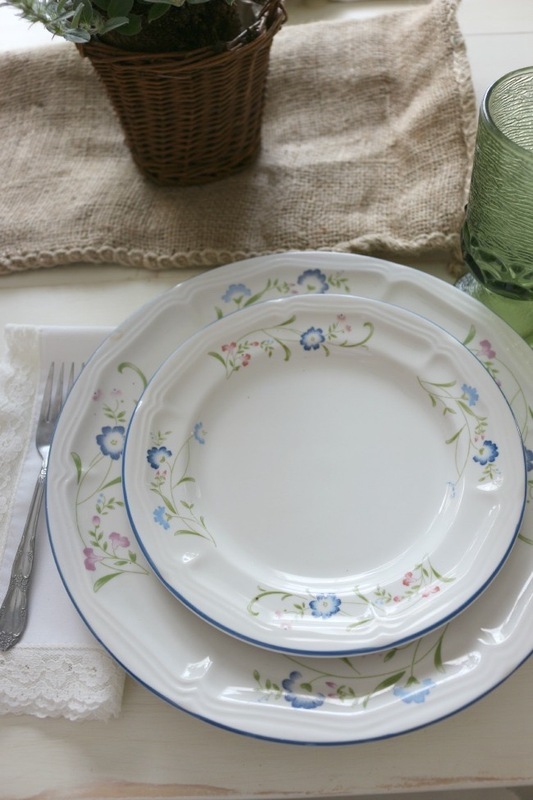 While I was changing out spring décor for summer décor in the living room, I started thinking about how to create an easy summer tablescape in the kitchen. The open floor plan creates the need for the living room and the kitchen table to compliment each other without competing given their close proximity. 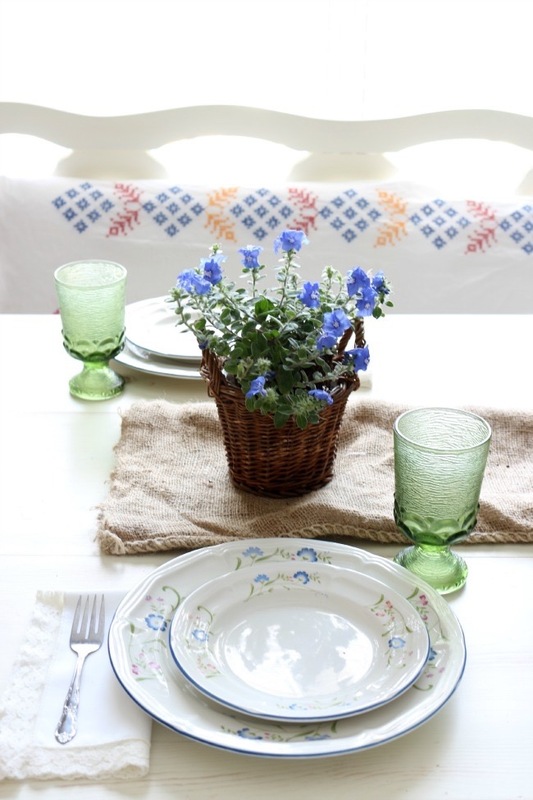 I’m in love with the cabin inspired summer mantle so I wanted to play off that inspiration with an easy summer tablescape. I started with the first set of dishes I ever bought for myself. They’re from Pic N’ Save and I don’t even think that store is even around anymore. I adore the pattern of blue flowers. They remind me of the wild flowers that grow in the field next to my Granny’s house. 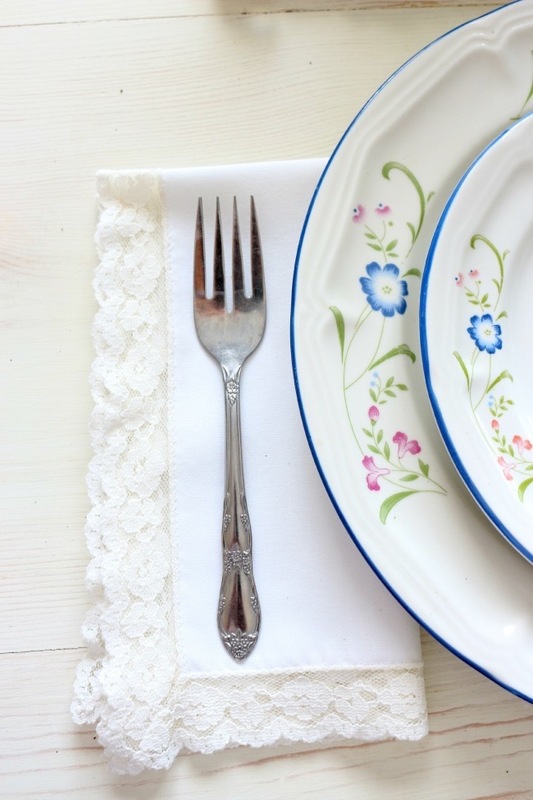 These vintage lace trimmed napkins have become a staple. I use them all the time. Sometimes at dinner parties, people will ask me if they’re supposed to actually use them, which makes me laugh. “Of course you are!” I always say. Then they look at me like only a messy eater can and I have to reassure them the napkins can be bleached and soaked in stain remover. My Dad bought me the burlap sacks. They normally hold peanuts or potatoes. I also use them as pillow covers because they fit perfectly. We picked up the flowers at Lowes. 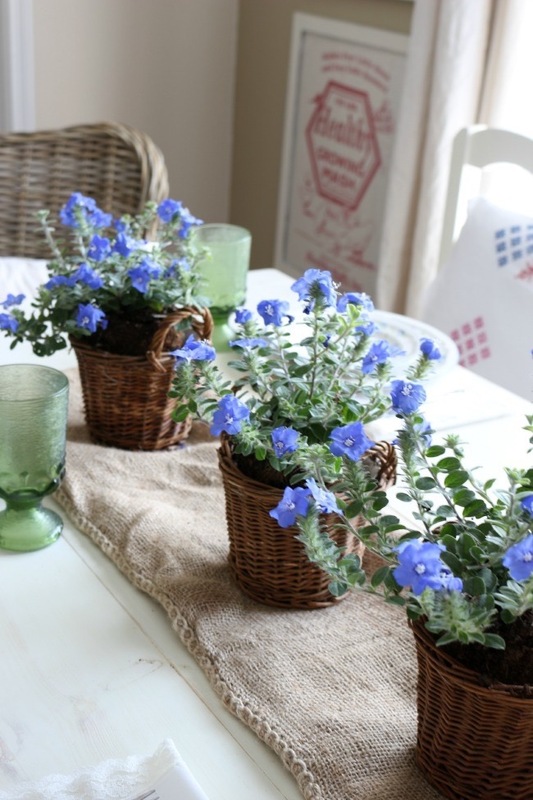 They’re called “Blue My Mind.” You may remember the little baskets from the spring tablescape in the dining room. I found those at a thrift store. The bench is made out of the headboard and footboard that my Mom had when she was a youngster. It needs pillows to be comfortable so I’m always on the lookout for creative ways to cover the pillows. 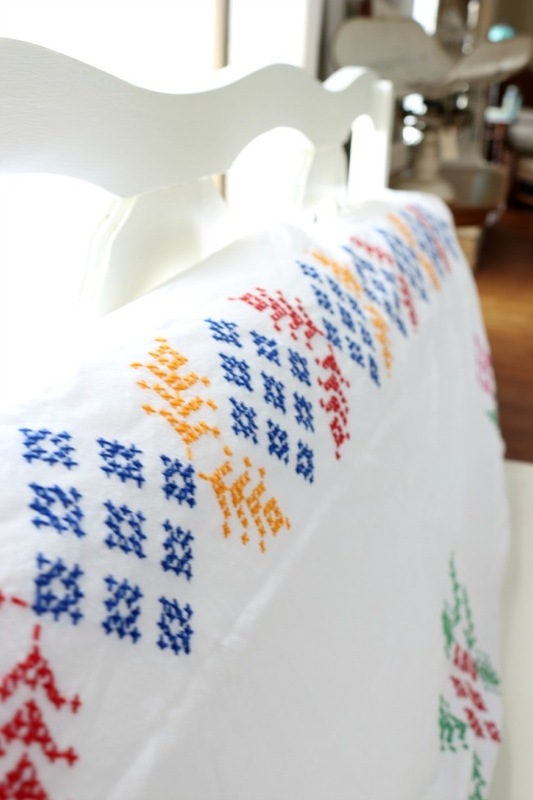 This needlepoint is actually a tablecloth that I pinned together with safety pins. I just didn’t have the heart to cut it up. I found it at a thrift store too for a whopping $2. Crazy, right? One of the goals I’m working on this summer is to make sharing a nightly meal a top priority. This tablescape took maybe 10 minutes to throw together. It has the kind of relaxed and carefree vibe I want to keep all summer long. See you guys back here tomorrow. 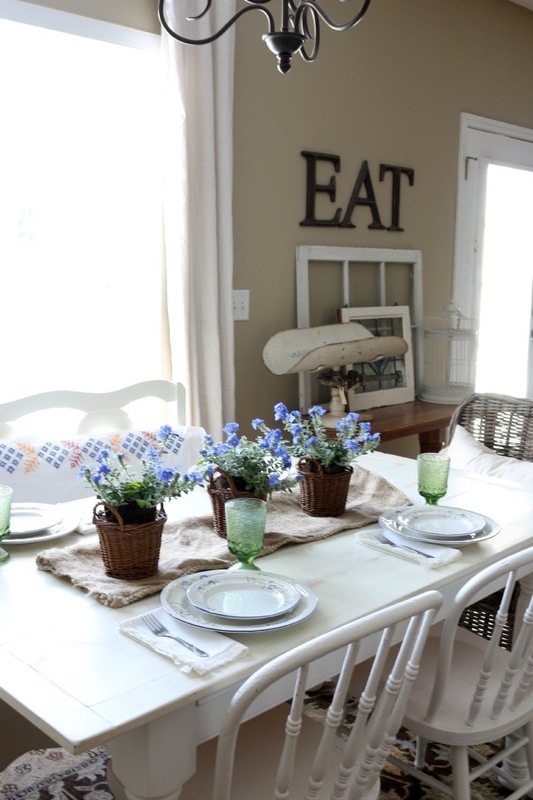 I have some things to share with you in the dining room. I really appreciate it, Angie, thank you! Your house has such a relaxed and welcoming vibe. I love all the pretty details! Thanks so much Kristen! See you on Friday! Gorgeous table! Pinned, tweeeted, and stumbled. Thanks for linking up and sharing with us at Funtastic Friday. Hope you join us again this week.